Disclaimer: This how-to is based on my personal experience. Please check with QC City Hall for official procedures. Real Property Tax (RPT) is a levy on real properties which is an obligation owners pay annually at their local government unit. 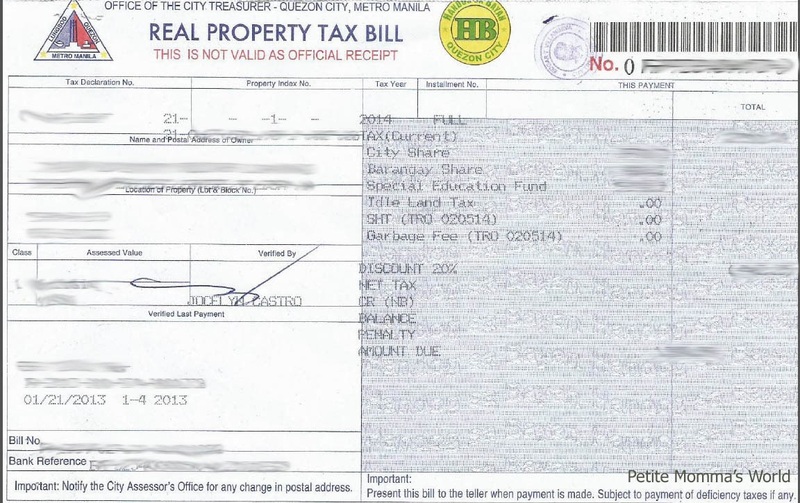 In Quezon City, the local government unit offers 20% discount to paying real property owners if they pay (fully) on or before March 31, 2014. So how do you pay your real property tax? 2. Proceed to the real property tax assessment unit of Quezon City Hall. This is located in the building where Landbank is. Get a number and wait for your number to be called. (There's a courtesy lane for Senior Citizens, PWD, and pregnant women). 3. Present your documents to the counter to have your tax assessed. For 2 straight years, I paid for the same amount. 4. City hall officer will give you your RPT bill for this year. 6. 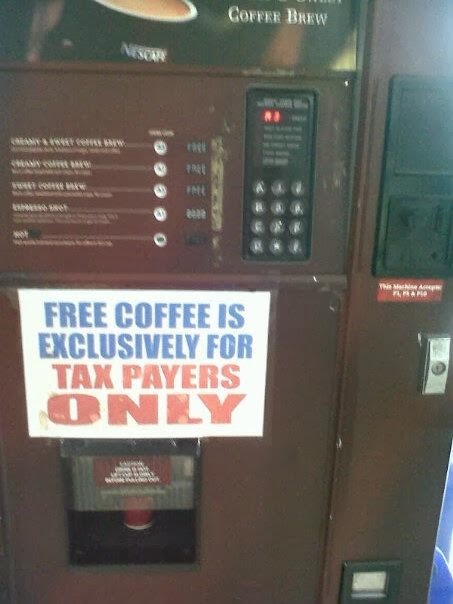 Pay your fees. Cashier will give you your receipt. Excellent! Now let's get a tax clearance. When you exit the payment area, turn right at Landbank and go to the entrance at the back of the building. Take the stairs and head to the second floor. (Oh, before taking the stairs, have your recently paid RPT documents photocopied first) Enter the door that says "City Treasurer's Office Real Estate Division." 2. City hall officer will ask you how many copies of clearance you need. Each costs Php50. A payment stub will be given to you and your photocopied documents will be returned. 3. Pay the Php50 at the Miscellaneous cashier area on the ground floor. There's no need to take a number, just proceed to any of the counters. Get your receipt. 4. Go back to the receiving counter on the second floor. Present your receipt and photocopied documents. The officer will give a claim stub for your tax clearance which you can claim at the same office after 5 working days. Thanks so much for this unselfish way of educating others who might be experiencing the same. Hello! Thanks for this post, it's very helpful. 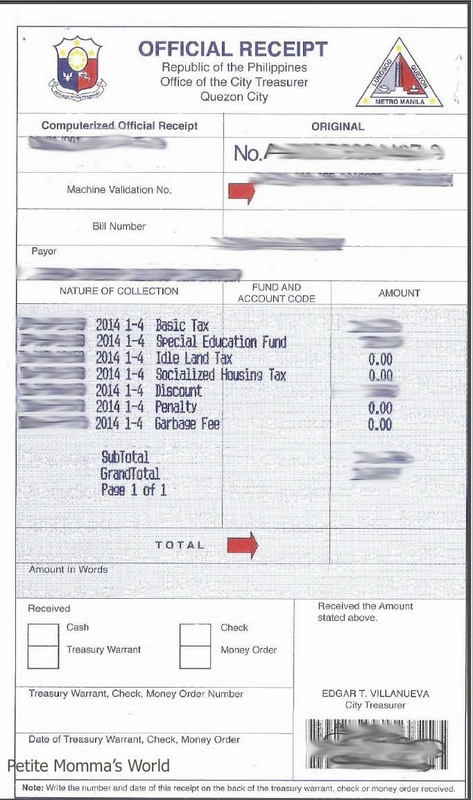 Hope you don't mind a quick follow-up question -- would you know why there is a need to get a tax clearance after paying the tax and getting the official receipt? Is that a mandatory step or do people get the clearance for some other purpose? Hi! The tax clearance was a requirement asked by my developer. I believe it was needed as a document for processing the transfer of titles, not sure really. I would have to know this year if they would still require it. Hi may i pls ask how much the real estateproperty tax? Hi Carla. It really depends on how much your property's value is. You will find the value of your property and the tax expected due in your tax declaration document that you can get from the city hall (or you can also request a copy from your developer if you are under a developer). I'm on a mission to secure and assure my family that this land property in QC is still in our mother's name. I probably could use a pointer/advice or two on this matter as I start form scratch by first paying land property tax. Overview: My mother from up the Cordilleras has a QC residential land/property. My (then) married sister built a house on this land in the 1990s with permission from my mother. my sister being an OFW had this house built on her own merit. Estranged with hubby early 2000 w/o legal paper of divorce or separation. Kids now are also OFWs. Hubby has long been out of the house with his second family but free to go in and out of this house. I have no clue about when property tax was last paid if ever paid. I assume that the hubby paid the property tax last. My sister passed away overseas last June. The original Deed of Sale is in someone's hands right now in Manila. Property is in Tandang Sora, QC. My immediate goal is to take the responsibility of paying for the property tax beginning this Novermber. Not sure po. Best to visit na lang po your city hall. may i just ask if you also know if i can still apply for tax clearance cert. even if i paid my real property tax last january pa (i wasn't informed, sad, it was my first to pay real property tax). Thank you in advance. I believe you still can. #PHthankyou | The Philippines says Thank You!